In Lottery.com Land, Wednesdays and Saturdays are just called Powerball days. To get pumped for tonight’s draw, we’ve rounded up some fun Powerball facts! Curious about the winningest state? According to data from the Multi-State Lottery Association, Indiana holds the highest number of Powerball recipients. It might be time to take a trip to Indiana! Trying to decide which numbers to play? 13 may get a bad rap as being unlucky, but it seems to be a magic charm for the Powerball! The top five main draw numbers for Powerball are 16, 22, 26, 32, and 41. Winners who choose the annuity option get paid in 30 installments over 29 years. Winners who choose the annuity option also earn more over time. Annuity jackpots are also paid out in an increasing schedule, which means the annuity payout increases by five percent every year. 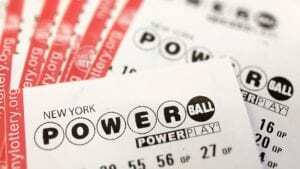 The highest Powerball ever was a cool $1.6 billion. Three lucky tickets split the jackpot, with $528.8 million going to the holder of each ticket. Read up on more newsworthy Powerball wins here.